Clint was right. And hickory wood floors, particularly unstained natural toned hickory floors are currently being sought out in the marketplace. At Real Wood Floors, we are finding that people want a floor that shows the natural characteristics of the wood including a good amount of the creamy white to caramel brown contrast from the heartwood to the sapwood. One of the secrets to getting high brown content in our flooring has to do with drumsticks. If you would like to know how drumsticks play a part, sign up for email updates on the right side of the page just under “Keep me updated” and I’ll fill you in. From Real Wood Floors' Parkview collection, this 3 1/4" Natural Hickory Wood Floor is a real conversation piece. 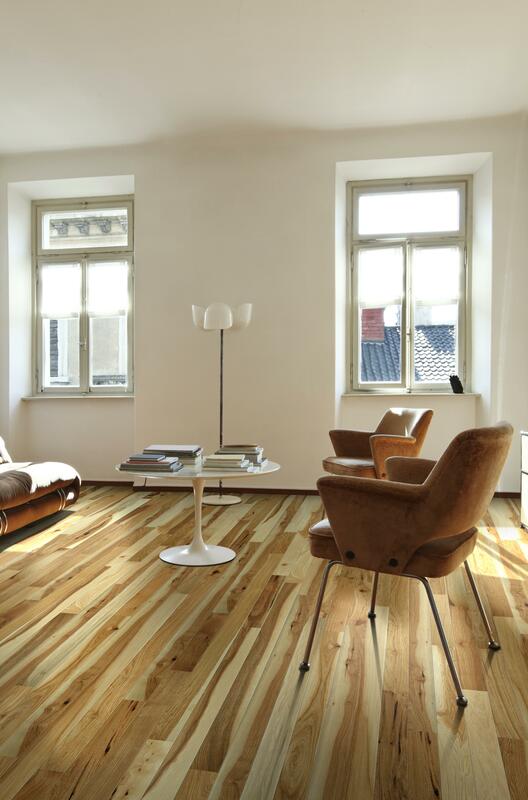 Gorgeous natural colours in this wood floor, lightens the room up nicely. Thanks for commenting Marianne, we need to make Hickory floors a trend in the UK!